The boys and I couldn’t stand it — we had to plan another camping trip. 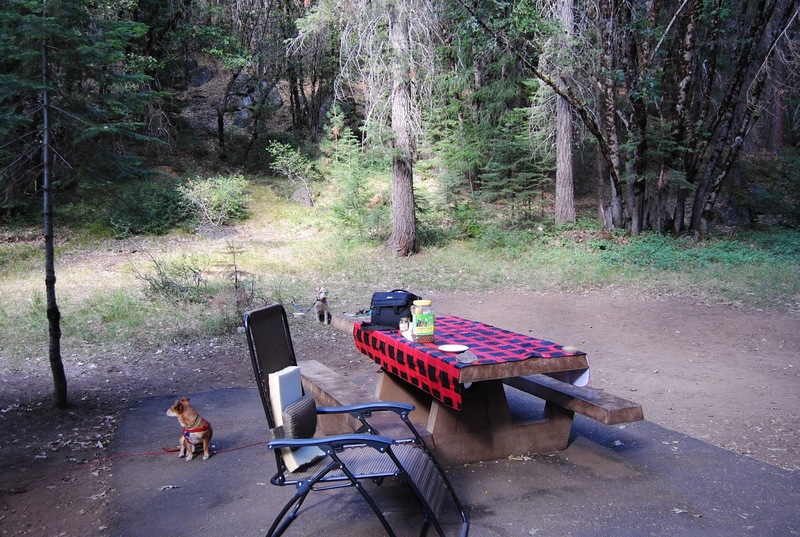 This time we stayed a bit closer to home selecting Fowler Falls Campground about 40 miles north west of Burney off Hwy 89 near the town of McCloud. Soon as Burger, Fries, and Charlie see certain items heading out the door they begin the excited happy dance :); well, maybe twirling and whirling around like demented little dervishes would be more accurate. They do love to go! Me, too! 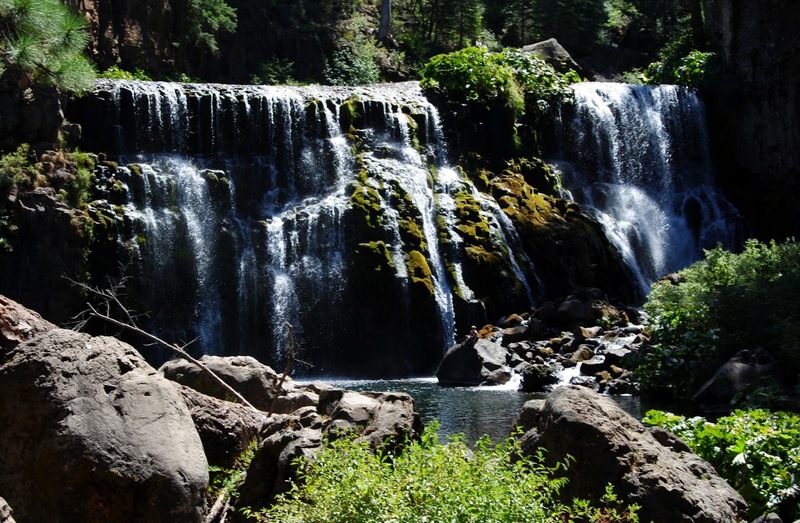 The Fowler Falls/Cattle Camp Campgrounds are no reservation, water, and vault toilet sites. 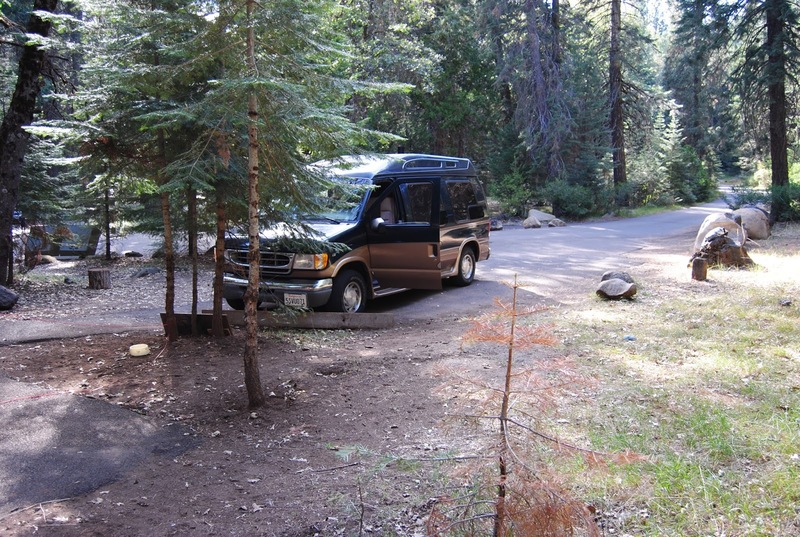 It’s a popular tourist area, but many just drive in to see the Lower, Middle, and Upper Falls never planning to camp, and there were lots of empty sites to select from. It’s also the week before school starts so I am sure that had something to do with it, too. Very warm, sometimes too blasted hot, is normal for afternoons around these parts this time of year so we chose a site with plenty of lovely dappled afternoon shade. 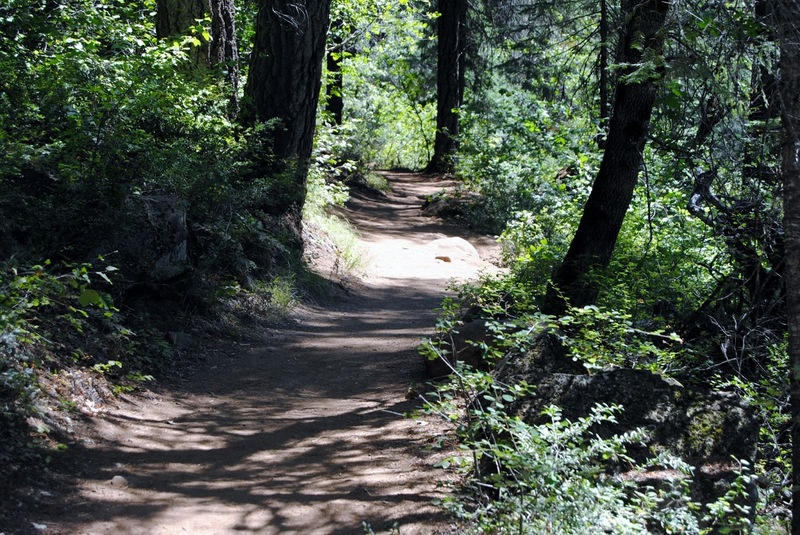 Despite our first outing through Lassen Park and on to Susanville (read about that HERE,) this one yielded even more insight on some things that need to be changed, things that need to be added, or things that can be left home. I will be changing how I pack the Cube Cooler, changing up the storage drawers to make things more convenient, as well as putting my cooking items in a different spot. The anti-gravity chair is going to stay home. I need to find one of those old fashioned webbed chairs to haul around instead. I have never been very comfortable in the big lounger, it bothers my neck. If I need to put my feet up I will find something from nature to use. This trip was also an excellent opportunity for the boys to get in some more socialization practice. My little Charles Barkley is a former street dog who had a broken jaw, and he’s not used to other dogs coming near “his” area. Some people are given the stay away message, too. He lets them know when he doesn’t care for their demeanor. He’s learning there’s a time for the alarm, and a time he needs to be quiet. Slow progress, but he is learning. Burger, the stubborn wire hair, eggs him on. Charlie had never seen a deer either I am sure, so he was pretty freaked out when one tried to creep through the trees and through camp to get down to the water. All in all though they weren’t too terribly bad, and our last day there yielded some really good behavior from him and the other two who are also rescues with varying degrees of abuse problems to work through. They all made progress in those areas this trip. 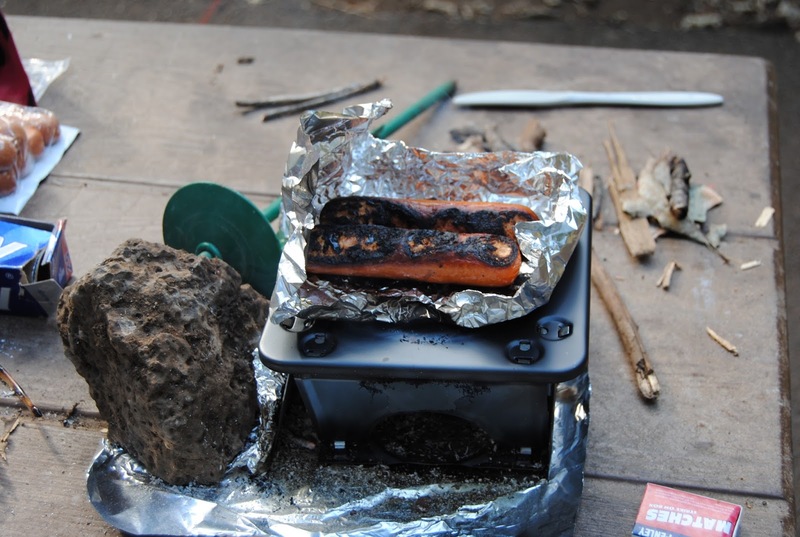 I couldn’t wait to try out the backpacker’s stove I bought a while back. Looks like I need a bit more practice with it; it got a lot hotter than I anticipated, and I burned the hot dogs on one side and they weren’t cooked enough on the other. The fuel used was small twigs. Burger and The Chiweenie Brothers didn’t mind the charred parts of the samples they received, though 🙂 —keep ’em coming mom! Next morning’s breakfast eggs were cooked using a cast iron skillet and canned fuel. It took longer than anticipated to cook, but the heat was more even. And I was so happy to have a decent meal I forgot to take a photo. 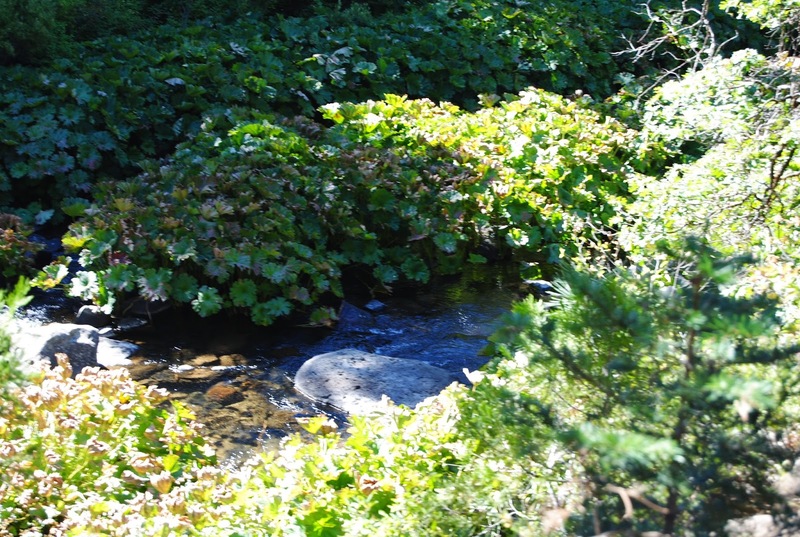 We leave you with a shot of the McCloud River (it’s really just a little creek now) meandering sweetly toward Lower Falls.